There are many archive footage websites which are offering their wares to the commercial footage researcher, but whose holdings are going to be of interest to the academic enthusiast. We’ve previously covered such resources as British Pathe and British Movietone, and will return to other such sites in due course. One that has come to my attention that is just a little bit different is CriticalPast. It’s certainly worth some investigation. 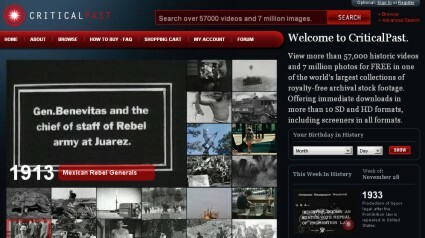 CriticalPast is designed to make films and still images easily available to professionals and non-professionals alike. It currently holds over 57,000 videos and 7 million still images, all royalty-free, much of it content from US government agencies, plus such familiar collections as the Ford and Universal Newsreels collections. While many footage allow visitors to view preview clips, CriticalPast lets users download footage or images immediately (upon payment, of course, and after assenting to a licence agreement), with different image resolution and prices according to usage. The cheapest rate is $3.97 (for iPhone, iPad, PowerPoint etc); the commercial rate for say an HD MPEG2 1080-25p depends on file size e.g. a 5 minute video of at 1.3GB would cost $145. What makes CriticalPast stand out, apart from the user-friendly ordering, is the quality of the searching experience and the sheer quantity and quality of what is on offer. It is almost all non-fiction film material, ranging from 1891 (genuinely so – it’s an early Edison test) to 1996 (a few rogue fiction films have slipped in, like Chaplin’s The Bond, D.W. Griffith’s The New York Hat and clips from The Birth of a Nation). The largest amount of material comes from the 1940s. As well as the simple front-page search there is an advance search option which allows to to search by specific dates, date range, colour, silent or sound, edited or unedited, language, and location. There is a very helpful timeline dividing clips up by decade, then year and thereafter by location. Once you have searched for any subject there is the option to refine your search further by decade/year, location and format. The cataloguing information is generally good, with concise, informative description and US Government Archive ID numbers. For any item you choose you can tweet about it, send to Facebook, Stumble Upon etc., email the information to a friend – and, yes, you can even view it. The images are all frame stills from the videos (British Pathe is another footage library which has created a subsidiary image archive by capturing frames as regular intervals as part of the video digitising process). 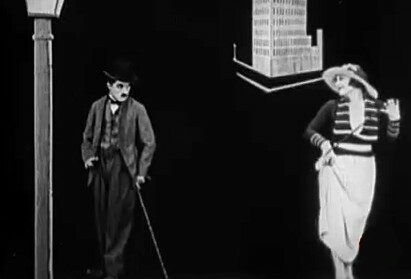 If we concentrate on the silent film era (which is our wont) there are some 7,200 clips available. You can find Edison films from the 1890s, then news-based material from around the world (it certainly isn’t just restricted to the USA, and interestingly there are quite a few British Gaumont Graphic newsreels), with strong World War I material (there isn’t that much in the archive before 1915), travel, exploration and industrial films, and much surprisingly material for the curious browser. I have found oil exploration in Persia in 1908, British food aid being received by Russian villagers in 1917, US black troops on horseback and bicycle in 1918, Hungarian newsreels of its brief Soviet republic of 1919, footage of Ernest Shackleton’s final Antarctic expedition in 1922, and the production of nitrate film stock in Rochester, NY in 1929. It’s a fascinating site, compulsively browsable, and really useful whether you are looking to use clips yourself or not. Go explore.